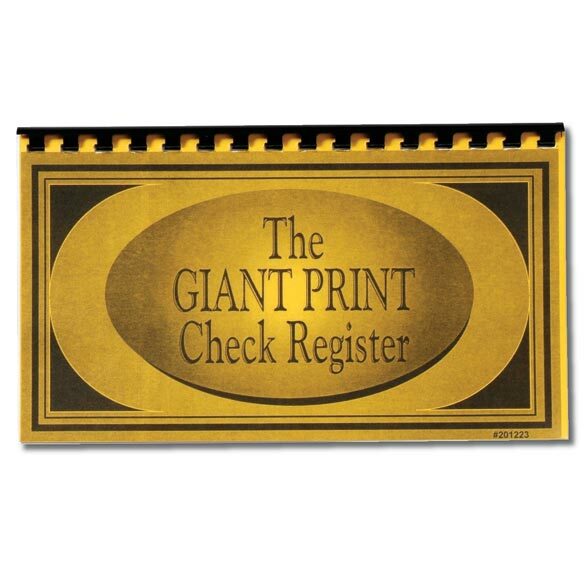 Large print check register has oversized rows and columns outlined in bold, easy-to-read type to make personal accounting easier for those who have difficulty with small type. 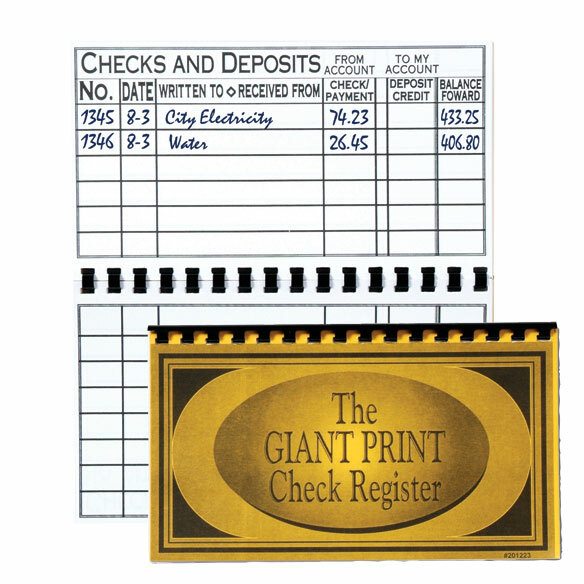 Spiral bound check register has 56 pages; measures 9" x 5 1/4". It's so much easier to write legibly in this check register. There is ample space to enter information. It facilitates balancing my checkbook. Having accurate entries is most helpful. I plan on using this product again and again. These items will help me keep track of medical and itemizing information for my taxes; most especially because it is in large print for one who has low vision problems. I hate the small ones that come with your checkbooks! I write kind of big and can never keep them in one little line. This is great. Could use a place for cents though. 1. I have been using a small notebook to keep track of my checkbook since my register ran out. 2. Saw these online and decided to order a few, am back to order more. Note: they would not fit in a check book but that is not an issue with me since I don't take my check book out of the house. I like this because there is a lot of room for each transaction-i.e. you can write down what you purchased with a debit card. The spiral binding to me makes them easier to use than a typical register. Also might be good for someone with aging eyesight as it is very easy to read what is pre-printed. 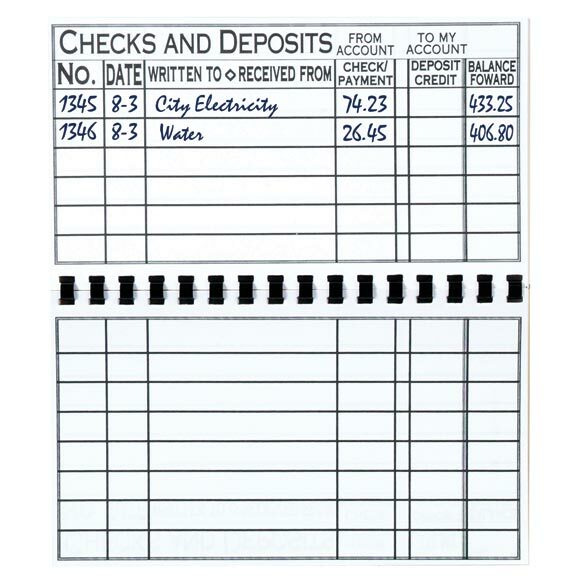 It's basically an enlarged check register that has several pages, which means it will last a long time. But for what you get, I think I paid too much for it. Needs a separate column to record cents. I have to draw a column for each page for each entry..debit, credit and total. I need a large check register because I can no longer write small enough to use the small ones. I really wish the register had more pages. At this rate I'll be using a new register every couple of months. Recording purchases on the top part will be difficult as I have to rest my palm on the spiral binding. The large spaces will give adequate room for recording purchases and costs. Needs lines for cents on Debit, Credit, and Balance. I can't understand why you would make such a large product and NOT DRAW ANY LINES for Debit, Credit, and Balance. Who wants to go through entire book with a ruler and pen and do the job you should have done. Re-do the book correctly and lower the price. Then you will sell a lot more. The register isn't useful at all. Way to big and bulky.